Yakubu Mohammed of AshantiGold SC from Obuasi in southern Ghana has been one of the revelations of the recently finished GLO Premier League 2010-2011. The burly striker became top scorer at AshantiGold SC with 10 league goals. 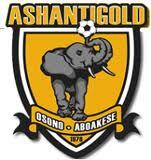 AshantiGold SC had a somewhat disappointing season, finishing as number nine in the league. According to the Ghana Football Association, Mohammed is born 26.07.1990. He will therefore be 21 years old later this summer. It is not easy to find information about the background of Yakubu Mohammed. According to the Ghana Football Association, Mohammed is a former player of Heart of Lions FC, Nungua United FC and Harbour City FC. I am not able to confirm this information. A player called “Yakubu Mohammed” made some impressive matches for Real Sportive Tema in the GLO Premier League 2007-2008, scoring at least three league goals. I have not found information confirming that this is the same player. There is also a left-winger called “Yakubu Mohammed” currently playing for Heart of Lions FC, but this is definitely a different player. As far as I know, Mohammed joined AshantiGold SC in the middle of the GLO Premier League 2009-2010. He made a few headlines by scoring five league goals during the last eight matches of the season. In January 2011, Mohammed was included in the squad of the Ghana U-23 national football team. Mohammed participated for AshantiGold SC during the 2011 CAF Confederations Cup, including matches against one of Africa’s top clubs, Etoile du Sahel from Tunisia. In May 2011, Mohammed was included in the squad of the Ghana B national football team for the 2011 WAFU Nations Cup. Ghana finished fourth in the tournament. Mohammed can be described as a typical center forward. He is stocky, extremely strong and basically built like a rock. He has the ability to create chances on his own and has also been known to score some spectacular goals, including free-kicks, overhead-kicks and stunning volleys. He also possesses an impressive leaping power, which makes him difficult to handle in the air. Yesterday, South African media reported that Mohammed would travel to top club Kaizer Chiefs FC for trials. Mohammed is obviously a raw talent who could very well blossom into a top striker. I am not sure that South Africa is the right country for Mohammed and ambitious European clubs should consider checking this player out. Contact me on my email adress : agent21football@gmail.com !! I’m also from Congo Lumumbashi too !! Thanks.